A broken compass, spinning in circles, with no idea which direction he&#039;s headed – Jameson Theodore, or Bipolar Man as he jokingly calls himself, has hit rock bottom. He hates his job, is only a year removed from a complete mental breakdown – a public one – and has no idea how to find his true place in the world. And he’s so high maintenance, when his compass was still working, he didn’t know how to read it anyway. Currently residing just south of downtown Men-Tal Metropolis, located in the northern tip of Kortecks, Jameson has forgotten who he is, or where he came from; he has become disconnected from the universe. His future was filled with promise, a universal inevitability of greatness, but all of the wrong turns he’s taken throughout life have smothered the fire of hope that once burned deep inside him. Hiding behind a wall of sarcasm, and inside a thick shell of self-deprecation, Jameson is confused, lost, and desperate…with nowhere to turn. One fateful night out with Midlife Crisis Max is about to change everything. 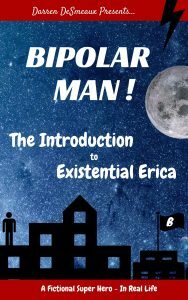 The first installment of the Bipolar Man! Comedic Adventures series sets in motion a chain of events, perhaps preordained, where Jameson learns there’s more to life than meets the eye. Against his better judgement, something pulls him out of his house to watch over his friend Max for the evening, who is in desperate need of help himself, and an invisible connective energy takes hold of the night. Jameson’s subsequent chance encounter with a guiding light, and his first sidekick – Existential Erica – illuminates his true life’s purpose…to someday save the world, from itself. A teacher, mentor, and blossoming friend…Existential Erica not only begins to align Jameson’s internal compass, toward a permanent transformation into Bipolar Man, but she also stumbles upon her own unique destiny. They’ll quickly learn that the universe knows more than they do, and every move they make will be scrutinized by the unwavering judgement of a higher power. The path will be dangerous, sometimes comical, and absolutely adventurous as Bipolar Man begins his journey toward becoming the truest and most unadulterated version of himself – a hero. Join in, buckle up, and follow the action that will twist and turn through a barrage of life lessons, adversarial challenges, humorous encounters, and a wild spectrum of emotions.